Last weeks repeal of the military’s Don’t Ask Don’t Tell policy is a great example of the current collective Jupiter-Uranus conjunction (currently a very tight conjunction within 4 degrees of exact) coming through. 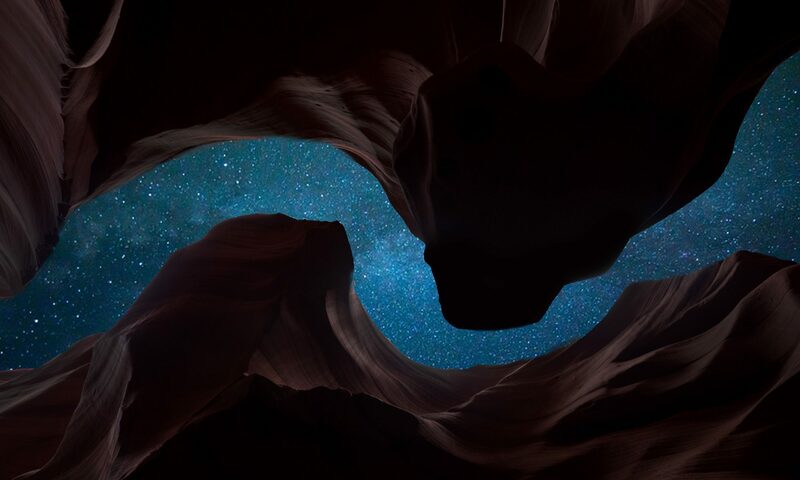 The Jupiter-Uranus cycle regularly corresponds to celebrated breakthroughs in many different areas of human experience (politics, science, the arts, sports, etc.). Richard Tarnas has thoroughly documented the Jupiter-Uranus cycle in his book Cosmos and Psyche, and last week’s breakthrough is consistent with the evidence he presents there. 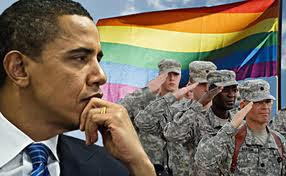 This event is being compared to the moment when President Truman abolished racial segregation in the U.S. military with his executive order 9981 on July 26 1948. This corresponded to the Jupiter-Uranus opposition of 1947-1948. This also feels similar to the archetypal vibe of the moment women were granted the right to vote here in the United Sates when the 19th amendment was ratified on August 18th 1920. That celebrated (Jupiter) moment of freedom (Uranus) occurred under that years Jupiter-Uranus conjunction. Many other great examples can be found in Tarnas’ book. The repeal of Don’t Ask Don’t Tell is also consistent with our current collective Uranus square Pluto alignment. This is a long alignment which started to get strong in 2008 and will last through the entire coming decade. The last time we had a Uranus-Pluto alignment was the conjunction that lasted from 1960-1972 and one of the big themes of that alignment was the sexual revolution of the 1960s. Uranus is the archetype of revolution, and Pluto is the archetype that has the most to do with sexuality. When the two come together geometrically we regularly see periods in history when we see progressive change in the area of human sexuality. 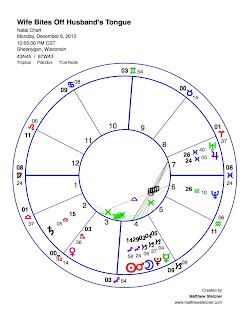 This is another cycle that Tarnas focuses on in Cosmos and Psyche, and many examples of this theme can be found there, but clearly we are seeing much evidence that this current Uranus-Pluto square is going to be a period when huge focus will be on the area of LGBT rights and freedoms, from all of the focus on gay marriage in recent years to this breakthrough in gay rights for members of the military. This is a pretty crazy story. This woman went into a manic state and bit off her husband’s tongue when he tried to kiss her. 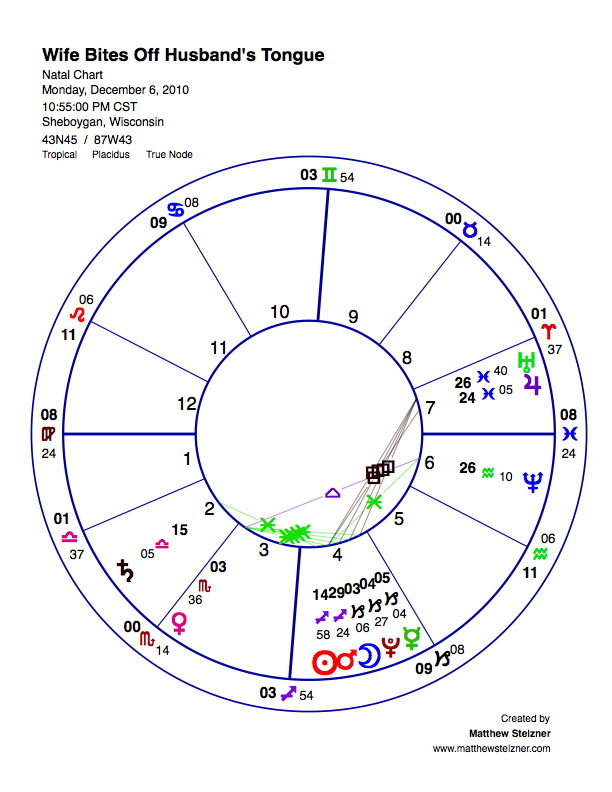 I don’t know the personal birth charts for the people involved with this story, but the collective chart for the time of the event is really striking. We have a pretty rare alignment in the sky right now: a Mercury-Mars-Pluto triple conjunction. On the night in question the Moon was involved: in a quadruple conjunction. The Mars-Pluto archetype is one that is associated with acts of animal aggression and primal rage. You often see it in the charts of people associated with violence/aggression (like Muhammad Ali, Mike Tyson, General George Patton, etc. ), and you often see it in the sky when there are news stories involving violence, road rage, assault, etc. What”s interesting here, though, is that Mercury is involved. Mercury is the planet that is associated with the tongue. Mercury rules communication and speech, and it really fits that Mercury would be on the Mars-Pluto alignment for the night of this event. And then the Moon is also in the configuration. This just adds even more artistry to the alignment, and it fits that this is a story of a aggressive woman (Moon) in an intense (Pluto), aggressive (Mars/Pluto), emotional (Moon) state, acting out in a domestic (Moon) setting.